Saranda is a quintessential Mediterranean destination located in the Southern part of Albania, experiencing five months of warm weather yearly and enriched with a number selection of dreamlike beaches. Tourists troops into the unofficial capital of the Albanian Riviera, in the summer to enjoy the busy beach and buzzling nightlife along its crowd-filled seaside promenade. You can savor what saranda have to offer with family by visiting natural landmarks, villages, natural reserves and Museums. The Spring (Syri I kalter): The Blue Eye is a 50 meters deep ground spring which pumps drinkable, crystal clear water, to the earth surface. The beauty of Mother Earth is exceptionally displayed as you can clearly see the algae and other wildlife on the bottom of the surrounding area thus giving it the beautifuI blue color. Lekursi Castle: The historic castle was built in 16th century (circa 1537), and situated on a hilltop, overlooking Saranda. The castle was built for security purpose as the location is a vantage point to spot potential invaders who might come on boat. There are excellent views of Islands of Ksamil and Corfu from the castle. Synagogue Complex: Located near to the City Hall in Saranda, these ruins show the presence of a large wealthy Jewish community in the city during the 5th century. There was an ancient community center, schools and religious activities. The floors have various type of mosaics such as animals,menorah and distinctive Jewish symbols. The buildings were reportedly said to be destroyed by Slavic invasion. 40 Saints Monastery: The 40 Saints Monastery was built in the 6th century and modified over hundred years. This is the place where the modern name“Saranda” is gotten from (In Greek Saranda means “40”). The monastery was built to honor 40 Christian martyrs (Roman Soldiers) who were killd in Siberia for refusing to renounce their religion. Butrint: The ancient city of Butrint is in the vicinity of Saranda. The UNESCO archeological park is a microcosm of European history with ruins from major empire; Greek, Byzantine, Ottoman and Roman. The Greek amphitheatre which was later remodeled by the Romans is a high spot here. You will also find interesting the cathedral, the baptistry, the cathedral, the lion’s gate. Saranda Bay: Saranda’s main beach is The horseshoe bay is a mixture of sand and pebble that can be found next to calm blue Ionian waters. 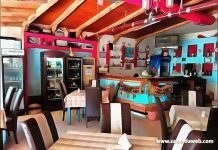 The beach is Saranda’s main beach and equipped with beautifuI European seaside getaway facilities. There are sunbeds, paddleboats by the shore and the beach is skirted by a promenade. Others include Phoenice, Borshi beach, Saint Charalampos Orthodox Church, Santa Quaranta beach, Pulebardha Beach, Saranda Embankment and so on. Museum of Archaeology – The single room museum displays the well preserved 3rd century mosaic floor and the Butrint ruins. 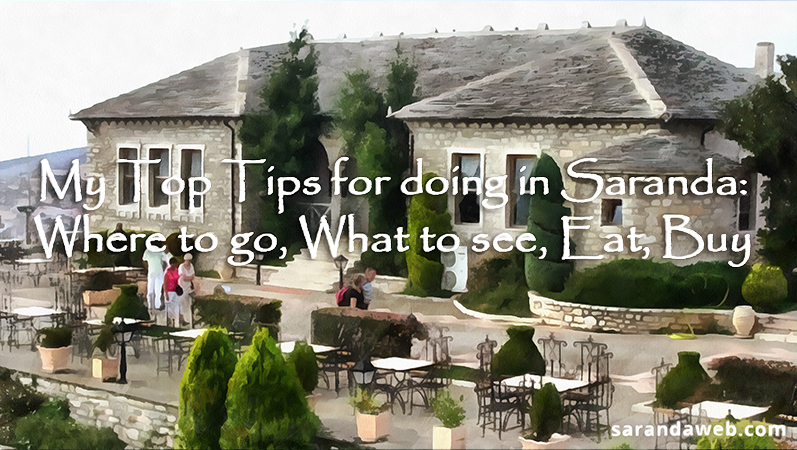 Saranda Art Gallery that showcases high quality exhibits from the National gallery. Don’t miss out 40 saint monastery. 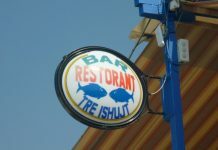 Albanian cuisine is a mixture of Mediterranean and Balkan traditions. Saranda which lies in the Southern part of the country is known to feast on fresh fish and seafoodss. Saranda culinary was also influenced by Italian recipe, hence Pizza and pastas can easily be gotten everywhere. Lamb is consumed a lot in Albanian from lamb and yogurt stew (Tavë kosi) to Offal (Lamb liver) and also locals favourite kukurec, a spit roasted porchetta-like roll of meat and stuffed intestines, give them a try. Cheese of hundreds of varieties are enjoyed by the residents and you cannot leave samand without having a bite of octopus or mussels dishes.And who go to Saranda without tasting Skandenberg, the Albania cognac beverage made from grape alcohol. 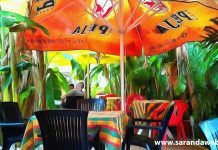 Saranda is characterized with cheap but unbelievably high-quality spices. They are various herbs, natural vinegar, bay leaf, parsely, garlic, mint, rosemary, sweet basil and many more. Pleasant trifle are always a good buy especially the ashtray which is the main Albania souvenir that can be best cherished when it’s History is known. On the opinion of many tourists the most elegant, nice and real Albanian souvenirs are Christmas tree decorations (Christmas balls, garlands and glass figures). They are manually made from high quality glass and ardoned with traditional national patterns which are passed on from generation to generation throughout the centuries. Silver jewelry happens to be the only high class gift that can be bought in Saranda. The oldest artistic craft of the Albanians is Silver processing. Silver Ring, earrings, necklace and pendant are made here. You can’t get quality silver wears cheaper in any part of the Europe. What was once a sleepy fishing village is now a thriving city, and while Saranda has lost much of its charm in the past two decades, it has retained much of its charisma. Welcome to Saranda.